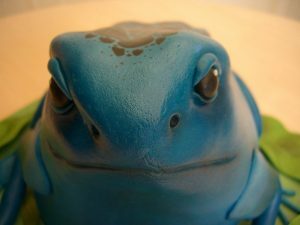 Where does the Blue Poison Dart Frog Live? They are found in the forests surrounded by the Sipaliwini savanna, which is in northern Brazil. 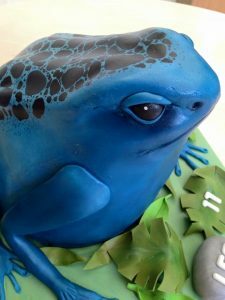 What does the Blue Poison Dart Frog eat? The blue poison dart frog feeds on ants, beetles, flies, mites, spiders, termites, maggots, and caterpillars. 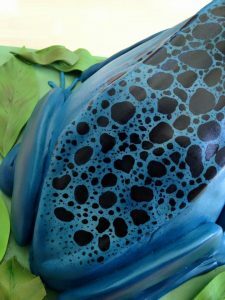 What makes the Blue Poison Dart Frog special? Its bright blue skin, usually darker around its limbs and stomach, serves as a warning to predators. The glands of poisonous alkaloids located a defense mechanism to potential predators. These poisons paralyze and sometimes kill the predator. The black spots are unique to each frog, enabling individuals to be identified. This species of frog has a distinctive hunch-backed posture.